Citrix is the market leader in the server-based client computing market with its XenApp, previously known as Presentation Server, offerings. 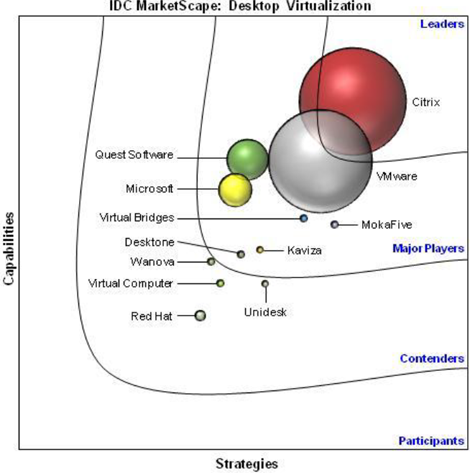 Citrix’s entry into the desktop virtualization market space was enhanced in 2007 with Citrix’s acquisition of XenSource. Since then, Citrix has leveraged the acquired XenSource technologies and in-house capabilities to introduce a new CVD product, named XenDesktop. As a CVD solution, XenDesktop is hypervisor agnostic, meaning that it can run on most commercially available server hypervisor. In recent years, Citrix has gained the leadership position in the desktop virtualization market by improving XenDesktop capabilities and overall strategic marketing. XenDesktop leverages Citrix’s existing desktop management and protocol experiences, networking expertise, and a robust partner ecosystem, including a strong partnership with Microsoft, to ensure that it can meet most of the customer’s requirements. The tie between work and well being has always been at the core or our company. And, it is also at the core of our corporate citizenship efforts. Our strategy is to inculcate an ethic of community stewardship into our culture. We focus on helping families in need, enabling those in our community to enjoy stable, satisfying and rewarding lives. We strive to enrich and empower our diverse global community through our people, technology and partners with a focus on three major areas — K-12 Education, Environmental Stewardship and Technology Advancement. With clear priorities, Citrix is prepared to do the most good in the areas it knows best. The workplace of the 21st century is undergoing a remarkable transformation, driven in part by innovation in consumer technology. People are increasingly bringing the smartphones, tablets and other devices they use ubiquitously in their personal lives into the workplace and expecting the same kind of rich, self-service experience they have at home. This “consumerization” is driving rapid change in business and IT, dissolving the lines between work and play, the office, home or somewhere in between. BCC Services certified engineers uniquely help enterprises meet these requirements – delivering the benefits of cloud with the flexibility, security and control that enterprises need to meet their specific business needs. Citrix technology offers the flexibility to balance work and life — the freedom to work anywhere, anytime, on a schedule that fits the employee’s life. Citrix technology enables a more people-centric, on-demand computing model that provides people the flexibility and freedom they want and IT the control it requires. Citrix technology gives business the agility needed to seize new opportunities, deliver exceptional customer service and create a more efficient organization.